This week had been a fairly busy week at work, and when I'm busy, the last thing I want to worry about it smudging a bright lippy all over my face. This lipstick is perfect for a tiny pop of colour that also looks natural and doesn't smudge due to the matte formula. I've had Revlon Pink Pout for a while now, and I mainly pull it out when my skin is paler. It's a soft, somewhat cool toned lipstick that looks great on its own or paired with some gloss on top of it. If I have a tan this colour goes a bit unnoticed on my face, it's a bit like a MLBB (my lips but better) colour for me. The matte formula can be a bit drying, so make sure your lips are well hydrated before putting this on as it will accentuate flakiness. But on the plus side, the matte makes it long lasting. In my opinion this colour is a pretty good dupe for MAC Snob, and here's an old post where I compared the two side by side. 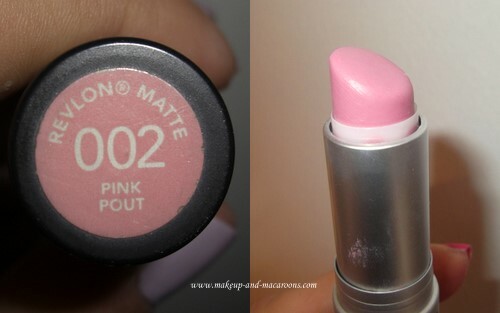 Have you tried Revlon Pink Pout or any of the Revlon Matte formulas before? Mac snOb washes me out, is this paler? This is one of my favorites as well. I also really like sky pink, which is more of a bubblegum pink matte. It really DOES look like the Mac snob. I was looking for a matte bubblegum pink. You keep making me put stuff on my want list! It looks great on you. Thanks for this review. I love a matte lip on you. You just have such perfect skin and you always do the rest of your make up to compliment the lips. Teach me oh wise one! Is there any lipstick you don't suit? I have Pink Pout and it doesn't look as nice on me :P still love it though! I love the Revlon Mattes. This pink is too pale for me but I have Strawberry Suede and In the Red and love them both. @SmolderPhloof - this one is slightly warmer toned and darker than snob, so it might look ok.
@Krystal - oooh I need to check that one out, I don't think I've seen them at the shops here. @Eden-Avalon - oh yes, the good old trouble with reading beauty blogs... your wishlist gets huge much to the dismay of your purse! @Priyanka - thanks hun, it's just a shimmery silvery grey which I've smudged all around, nothing spesh. It's my lazy look. @Kimmi - oh puhleese babe, YOU have the most amazingly clear skin I have seen EVER. I'm just good at concealing my bad bits and spots with foundation. Everytime I've seen you your skin GLOWS! @Nat - these aer quite good for the price, plus they're actually not as drying as some mattes can be which is good. @Silhouette Screams - LOL, yes, there are plenty of colours that don't suit me except I've managed to work out those colours and never wear them! Basically anything brown toned and warm reds and berries... you'll never find me in those! @Catherine - thanks so much. @themustardjumper - I've been meaning to check out strawberry suede but my local priceline is somehow always sold out of them! I'm beginning to think they're discontinued.